Venterra Realty is one of the leading providers of full-time positions for leasing managers in Tampa. We have developed a culture of success that begins with putting our employees first and ensuring they have everything that need to thrive. From our core values to how we celebrate the successes of each of our employees, Venterra is a place built for long-term success. If you are looking to become a leasing manager in Tampa, you’ll appreciate the way we align our business with our core values. The reason that we have been successful is because everything we do, from training to our day-to-day operations, falls in line with those values. Honesty, integrity, humility, openness, integrity, and a team-first mentality are just a few of the values we hold dear. What this means for you is that if you join our team, you’re expected to hold yourself to the same standards that we place on all of our team members. We also expect that our team members put these core values into practice when they’re in the office or out in the field. A successful candidate for leasing manager in Tampa should have similar core values, and if that’s something you believe in, there’s a chance you’ll be a great fit at Venterra. 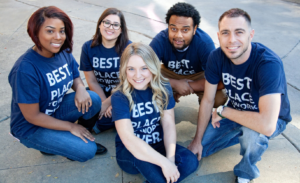 We are constantly listed among the top places to work because we make a point to celebrate successes, both big and small, of each of our employees. The first way we do this is by hosting an annual kick-off party, where we recognize our top performing teams and individuals. If you join our team as a leasing manager in Tampa, we want you to understand how what you do contributes to the bigger picture. We also want to make sure that our team members know how important they are at Venterra. Additionally, we have an annual leadership conference where we train you to think bigger and excel in your role as leasing manager in Tampa. The majority of our corporate jobs are filled from within, and we always want our team members to set goals and thrive. If you think we’re the right fit for you, head over to our apply now page where you can find a list of open positions, like leasing manager in Tampa. We’re always looking for the best and brightest to join our team and if you have what it takes, then we want to hear from you today!